Experts say that the sense of smell is closely tied to memory. One of my favorite scents in Hawaii is plumeria. When you step off the plane after a long flight, the smell of flowers is one the most welcoming things about the Aloha State. 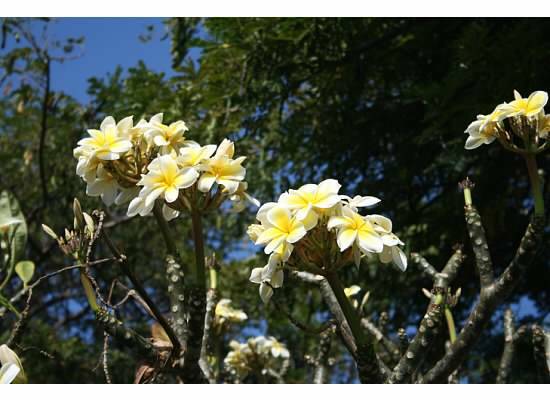 You will find plumeria in yellow, pink and other colors. The yellow plumeria flowers are my favorite and they seem to make some of the most fragrant leis. If you find one at a local farmers’ market, you will not regret buying it. In March, we found a yellow plumeria lei at the Farmers’ Market on Ali’i Drive in Kailua-Kona on the Big Island. The man who sold it to us had just made it. It was, perhaps, the best $7 I had spent all winter. Even after it had dried, it still smelled wonderful. The Hawaiian people love their flowers. Many Hawaiians wear flowers in their hair. This may be one reason why Hawaii was ranked the happiest state in the country in a recent article in The Atlantic.